William F. Curley is a Co-Founder of the America Party, Pending a partnership buyout-CEO of Blue Shirt Design, LLC., an author, conservative, and registered Independent. This blog has been up and running in different forms over the past 7 years. WFC has had interviews with Soldiers on the front lines, and politicos from both sides, such as Chuck Schumer (D-NY). 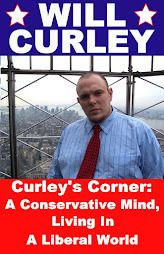 Forever fighting for Conservatism against the liberal state machine, CURLEYSCORNER.COM is you #1 resource for politics and opinion! good to see the site is still active. i guess i haven’t checked in for a while. keep up the good fight. and hope you are your family are doing great.